One shouldn't draw any kind of equivalence from these quotes. This isn't a, "well, they're both good points. You can make a case for either side" situation. What they do is illustrate just where English football is on the issue of black managers in our sport - more pertinently, the lack of them. In English football's four divisions, there are 92 clubs. The amount of black managers at those clubs? Two. This imbalance was set to be addressed at the last AGM of the Football League (which encompasses the 72 teams outside the Premier League). However, the organisation's chairman, Greg Clarke failed to broach the topic, going on to decry criticism of this as, "the shrill voices of the vested interests." Much talk has centred around the NFL's, "Rooney Rule" as a panacea, which ensures that at least one person of colour must be interviewed when a head coaching position becomes available. It's said that such a measure could offset the paucity of managers of colour in English football. More recently, Sir Trevor Brooking, the former Director of Football Development at the FA said he was against such a regulation, offering choice quotes such as, "Some black coaches say they're not given a chance, but I do think a lot of them have to get themselves in that position", and, "There is a reluctance from people sometimes and they feel it should be handed to them." While those were the incendiary statements, the most telling comment came when he said, "I'm a strong supporter of trying to invest in the right ethnic mix of players and new coaches - but they've got to be on merit." The "merit" argument. Pay close attention whenever anyone invokes this. When they state it should be about the right person, no matter what race they are. Such a statement presupposes that any black people in management positions probably aren't there on merit. I'm yet to hear anyone advocate for people of colour to given managerial jobs if they're not qualified. What's being requested are opportunities. Nothing more. 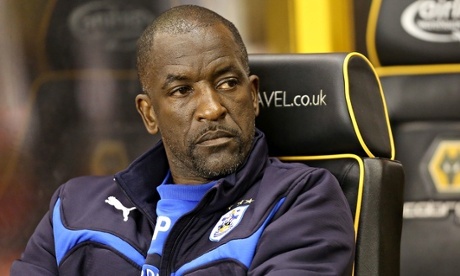 It should be stated that the Rooney Rule doesn't automatically increase the number of black managers. It just means that more will be interviewed for vacant positions. Personally, I have doubts that the Rooney Rule is workable in the context of English football. The Daily Mail's Martin Samuel discoursed on how the threat of relegation is a complicating factor that North American sport doesn't have to consider. Also, the insular nature of football often means that hirings don't function along the lines of recruitment in other industries. To refer to the Gordon Taylor quote at the top of the page, informal communications, nods and winks, and friends of friends safeguard a closed shop environment, where only a narrow pool of men are considered. This leaves men of colour throwing figurative stones at the buildings of power. And as always, we're left waiting for the gatekeepers of the game to institute reform at their leisure. Lamenting this, The Mirror's Oliver Holt recently said, "The Premier League won't do anything about it, the FA won't do anything about it, the Football League won't do anything about it." So, while the Rooney Rule may not be the solution, what's disconcerting is that those in positions of influence don't seem to be looking for one, assuming that if we give it time, the problem will fix itself, while the likes of Ricky Hill and Michael Johnson are left to wait for a chance that will never come. Let's have this right. Jose Mourinho's opinion is not anomalous. It may be asinine, but it's an accurate summation of what many people in football think. Dave Whelan and Richard Scudamore are examples of men who dissuade implementation of the Rooney Rule, and yet offer no viable alternative. The fact that no committee has been set up to look at the issue, the fact that no legislation has occurred to ameliorate this inequity, the fact that - as Yasin Bangee wrote - you would struggle to name ten black football managers, the fact that the absence of Britain's Asian population goes unmentioned, and the fact that people of colour never get to lead the discussion is testament that a problem in football only counts as a problem when it concerns white men. For clarity's sake, I don't think English football's powerbrokers are actively trying to hinder men of colour from management positions. The reason I think this is because they don't have to. The structure of our society does that for them. UPDATE: The Football League announced that they will review the matter next month. A PR move? Possibly. But it's a start. Let's hope it leads to something substantial. This piece was first published on Media Diversified. - In any industry. Not just in football. - While the article has a pungent stench of paternalistic whiteness, it does make some salient points. - Roxane Gay once judiciously stated; "It’s not that people of color are deliberately excluded but that they are not included because most communities, literary or otherwise, are largely insular and populated by people who know the people they know." - When has that tactic ever worked in progressing social change?